Fragrant, five-petal, lobed flowers of the frangipani (Plumeria spp.) occur in abundant sunshine when temperatures are warm to hot. Naturally deciduous in the cooler or drier months of winter, frangipani doesn’t flower when it's cool. Proper cultural techniques from watering to fertilizing also affect blossom development. The more branch tips on a plant, the more flowers are potentially produced. When days get longer, the sun’s rays more intense and temperatures remain above 60 degrees F, frangipani branch tips form flower buds. Anytime from mid-April to late August, flower buds appear and then open. Summertime is the season for frangipani flowers. Do not worry if flowers rarely or never appear in fall, winter or spring. This is natural. 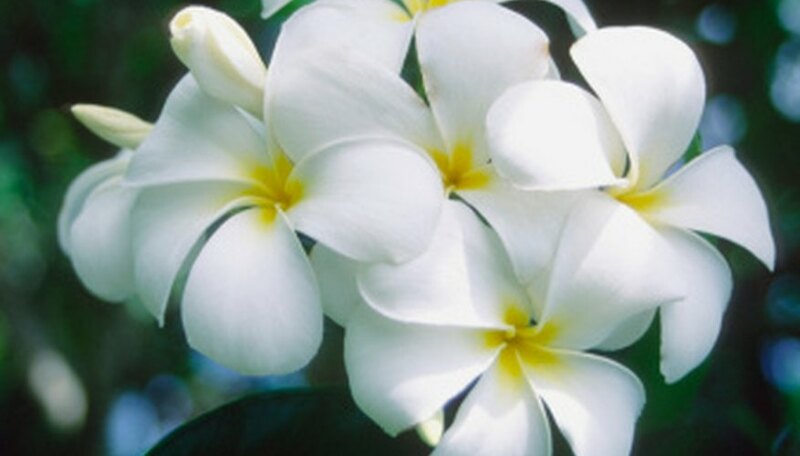 Frangipani plants need at least six hours of direct sunlight to bloom heavily. The red wavelengths in sunlight trigger hormone formation that creates flower buds. Adequate exposure to sunlight promotes the most widespread display of flowers across a plant. Trunks and branches grown basking in lots of sunlight are thick, stout and strong. Overly shady conditions yield leaning plants with slightly softer, thinner branches. Ample sunlight also ensures soil and air temperatures promote growth and blossoming in summer in the 75 to 90 degrees F range. When a frangipani is dormant lacking any leaves from fall to spring, the soil needs to remain barely moist. Cool temperatures and wet soil lead to root rot. From spring to fall when branch tips bear leaves and flowers, more watering is needed. Do not overwater frangipani, even in summer. Feel the top 2 to 3 inches of soil. If it’s damp to the touch, delay irrigation. In summer, plants need an evenly moist soil to sustain foliage and flowering. Too much water causes rot, while drought causes leaves to abort. Improper watering causes plants to be stressed or unhealthy and do not bloom to their full potential. From late spring to late summer, application of water-soluble fertilizer in conjunction with proper watering promotes better flowering. Avoid fertilizers that are high in nitrogen, as it promotes leaf production at the expense of blossoms. Phosphorus promotes flowering. A 10-50-10 formulation works well. Choose a fertilizer product that provides trace or micronutrients, such as iron, magnesium and boron. Fertilizing frangipani every two weeks or once a month from late April to August encourages the best flowering display.